Active ingredient: Cerebrolysin Concentrate (complex of peptides derived from porcine brain). 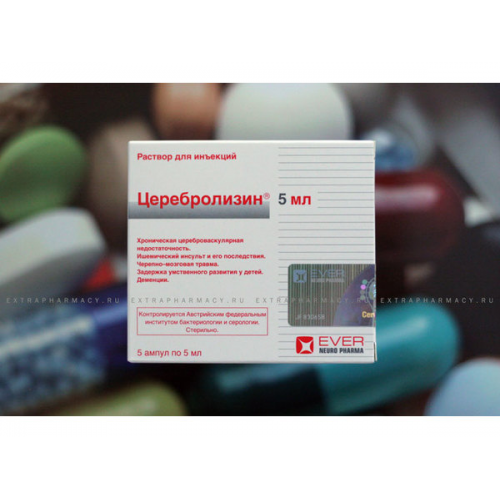 in the complex therapy of endogenous depression resistant to antidepressants. Intramuscular (5 mL), intravenously (10 mL), intravenously by slow infusion (10 to 50 ml). Dose and duration of treatment depends on the nature and severity of the disease, and the age of the patient. Possible usages of single doses, the magnitude of which can be up to 50 ml, but it is more preferred to conduct the treatment. Recommended optimal course of treatment - daily injections for 10-20 days. Acute conditions (ischemic stroke, traumatic brain injury, complications after neurosurgical operations) - 10 to 50 ml. In the residual period of stroke and traumatic brain and spinal cord - from 5 to 50 ml. When psychoorganic syndrome and depression - from 5 to 30 ml. In Alzheimer's disease, vascular dementia and Alzheimer's combined-vascular origin - from 5 to 30 ml. In neuropediatric practice - 0.1-0.2 ml / kg body weight. To increase the effectiveness of treatment can be carried out refresher courses as long as there is improvement in the patient's condition as a result of treatment. After the first course of the frequency assignment of doses can be decreased to 2 or 3 times a week. Doses of 10 to 50 ml recommended only by slow intravenous infusion after dilution proposed standard solution for infusion. The duration of infusion was 15 to 60 min.